One of the most deadly type of car accidents is the “T-bone” car crash, where one car drives head-on into the side of another car. These accidents are of course especially serious because you have the full force of one vehicle heading straight into the compartment where a driver or passenger of another car is sitting with only the door between their body and the other vehicle. Such accidents often occur at intersections – especially in cities like Los Angeles where there is severely crowded traffic and an abundance of negligent drivers – when one car is turning left at the intersection and another is going straight through the light, smashing into the side of the car turning left. 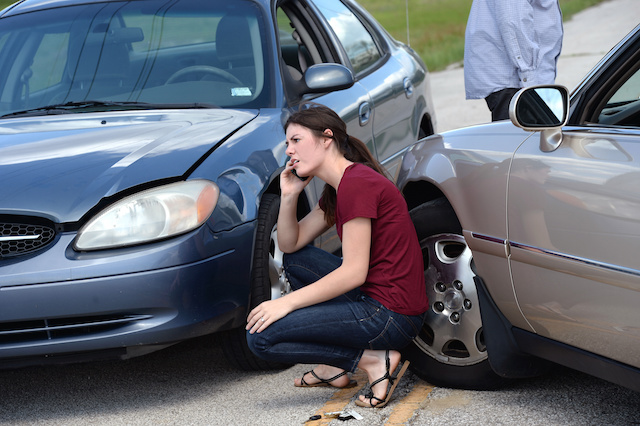 In California, car accident claimants are required to prove fault in order to recover from a defendant. This can be done at trial, but in most cases, the parties’ attorneys will negotiate a settlement out-of-court. In settlements, however, it will still be important for the claimant to demonstrate that fault – in other words, that the defendant failed to act with the proper level of care in the situation, and the plaintiff was injured as a result – in order to win recovery. Turning left during a green light: A car turning left while the light is green should make sure there is enough space before oncoming cars enter the intersection. But if the oncoming car suddenly sped up or changed lanes in the middle of the intersection, a court might find negligence on that driver’s part. Turning left during a yellow or red light: In California, a driver attempting to make a left turn at a lighted intersection may enter the intersection only if they “have enough space to complete the turn before creating a hazard for any oncoming vehicle, bicyclist, or pedestrian.” Thus, if you are hit by an oncoming driver who have failed to yield at a yellow or red light, that driver could be liable, but a court will want to see that you entered the intersection safely (e.g. not that you were the fourth driver to turn against the red light). Turning right during a red light: It is generally legal to turn right on a red light unless posted otherwise. But when a driver makes a right turn without leaving proper space to avoid being hit, that driver might be liable. Other factors can play into whether one driver was negligent was as well. For example, if a driver had alcohol or drugs in his system, that could be evidence of negligence. In addition, a court will look at whether a driver was distracted by a phone and/or was paying attention to the traffic. By contacting an experienced personal injury attorney as soon as possible after a T-bone accident, your attorney can immediately begin the process of collecting the evidence in your favor to show fault and help you win your maximum recovery.